Sphaera provides a complete range of training material for EASA Part 66 such as traditional printed books, elearning modules and highly interactive computer based training (CBT) to support delivery in the classroom. The following products are all used by aerospace engineering colleges (EASA Part 147 approved organisations) to enhance the learning experience when studying the EASA Part 66 syllabus. Unless otherwise stated, all products listed below run on a standard PC and are licensed for instructional use within the classroom. 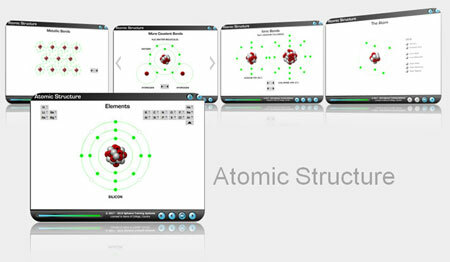 This package of 6 interactive animations can be used in the classroom to describe the structure of an atom, the different elements in the periodic table and explain the different types of bonding (covalent bonds, ionic bonds and metallic bonds). 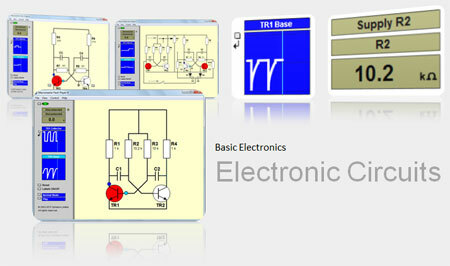 This pack of 3 interactive electronic simulations features an astable circuit, a bistable circuit (flip-flop) and an astable/bistable circuit. The integrated digital multimeter and 2 oscilloscopes assist the demonstration or observation of circuit operation and can also be used for methodical fault diagnosis procedures. 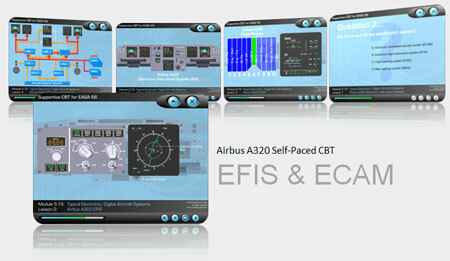 Sphaeras A320 CBT provides an excellent example of a typical layout of an electronic instrument system, delivering approximately 25 minutes of fully-featured student self-paced training (with narration, interactivity, embedded questions and remedial branching) on the EFIS and ECAM. This package of 8 titles includes the 3 flight instruments trainers (altimeters, airspeed and VSI) and 5 indicating systems trainers (position indication, engine speed, engine temperature, pressure indication and fuel contents). Purchased as a package, this will save 20% of the normal price (normally £2,920 if 8 titles purchased individually). All of the above allow instructors to demonstrate how the instrument operates with full control of the inputs. All instruments are supplemented with interactive schematic diagrams and most also include 3D representations of the real world situation. VOR Trainer is a fully interactive program used by groundschools and aerospace engineering colleges to help students understand the function of an HSI, RBI, RMI and VOR Indicator as well as DME. This classroom training aid can be used to demonstrate a full range of gyroscopic principles, which includes the option of viewing the gyroscope in a mount and then applying force or torque to the inner or outer gimbals to clearly demonstrate Sperry's Rule of Precession. 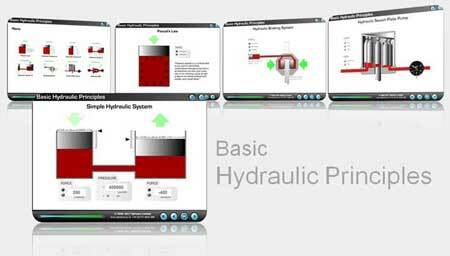 This package of 8 hydraulics interactive animations can be used to explain Pascal's Law and basic hydraulic principles, as well as showing how those principles are put to use in simple braking system. It also includes some basic hydraulic components like a swash plate pump and an NRV. 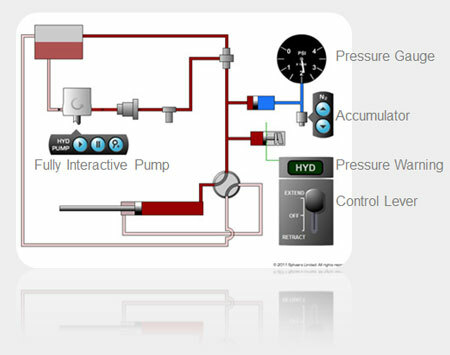 This fully interactive simulation of a typical generic aircraft hydraulic system provides complete control of the pump, control lever and accumulator enabling instructors to clearly demonstrate the purpose and operation of the system components and their associated cockpit controls and indicators. 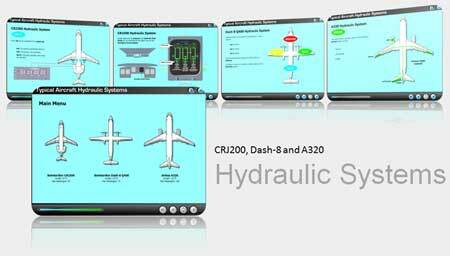 These overviews of the hydraulic systems from 3 modern airliners feature sharp, clear and colourful images enabling students to quickly acquire all the essential knowledge to describe the purpose and functions of the main and back-up hydraulic systems, their normal sources of power, back-up supplies, distribution and their associated cockpit controls and indications.The 3 aircraft featured are the Bombardier CRJ200, Bombardier Dash-8 Q400 and the Airbus A320. If you need something similar to the material shown above but can't a supplier, don't worry! We can create CBT for any aircraft systems, made specially to your requirements! The ATC Transponder CBT Trainer features an altimeter, ATC Panel and ground ATC radar station with fully controllable PSR/SSR and PPI display. It provides everything an instructor needs to clearly describe, explain or demonstrate emission of PSR pulses (and their reflected echoes), emission of SSR interrogating pulses (P1 and P3), control pulses (P2), mode A and mode C interrogations, selection of squawk codes and more. The DME Trainer features DME, VOR and ILS ground stations and enables instructors to explain how aircraft navigate between them using X and Y channel interrogations. It provides everything an instructor needs to clearly describe, explain or demonstrate selection of VHF radio navigation frequencies, remote tuning, calculated groundspeed, time-to-station, format of X and Y channel interrogations and more. The Air Weather Radar Trainer features gain, mode, range and tilt controls, a good range of weather cells of varying levels of precipitation and the simulation 8 typical defects. It provides everything an instructor needs to clearly describe, explain or demonstrate the display of various levels of precipitation, analysis of weather cells, identification of ground features, effective tilt management, appropriate range selection and more. The ILS Trainer features a wide range of functioning ILS instruments, Nav Panel and clear visualisation of localizer beam and glideslope. The engine altitude trainer enables instructors to clearly demonstrate the effect that aircraft altitude and velocity has on gas turbine engine performance in the form of changes to gross thrust, net thrust, mass airflow, fuel consumption and velocity of the gas flow. For demonstrating how engine indicating systems such as EGT (exhaust gas temperature) gauges operate, the Engine Temperature Trainer allows the instructor to control engine temperature by sliding the thrust lever forwards or backwards to demonstrate how the temperature in the engine causes current to flow through the thermocouple harness. The Engine Temperature Trainer can also be bought as part of our Aircraft Instrumentation Package. With N1 and N2 gauges that receive input from animated schematic diagrams of a tachometer system and pulse probe system, instructors can control engine speed by sliding the thrust lever forwards or backwards to demonstrate how the tachometer and pulse probe systems translate speed of rotation into an indication on a gauge. The Engine Speed Trainer can also be bought as part of our Aircraft Instrumentation Package. This interactive animation clearly demonstrates the working cycle of a 2-stroke engine and enables the instructor or student to play, pause and step. This interactive animation clearly demonstrates the working cycle of a 4-stroke engine, enabling instructors or to student to play, pause and step. We can also provide a complete range of study material in the form of printed books or electronic versions (which run on all devices including computers, laptops, tablets or smartphones). 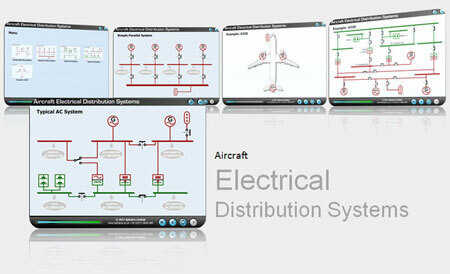 The material covers all 17 modules of the EASA Part 66 syllabus. These can be provided as a complete set, as B1/B2 packages or as individual modules. Contact us to discuss your requirements. This world class material has been continuously developed over the last 10 years and is fully endorsed and regulated by the UK CAA on an annual basis. To to really bring the subject to life in the classroom, you also have the option to fully customise the material to add any additional interactivity that instructors may require. Or alternatively, you can choose from some off-the-shelf CBT above which is already available! Our range of COTS (commercial off-the-shelf) aviation training products is complemented by our affordable bespoke CBT production service. So, if what you require is not on this list contact us and we will be delighted to discuss your requirements with you.